It is my view that there can be a successful company model that rests on an open source protocol, and that is surrounded by a vibrant ecosystem of developers and value-added services. That is the genesis of the OpenBazaar model, as they push us forward towards a future of decentralized, peer-to-peer eCommerce. Open source software models have been around for a while, but they have been hard to monetize, at least until the actual business model gets finally figured out. But there is a lot of room for innovation, both at the business model level, and in terms of the outcomes of such organizational configurations, especially due to changes in the nature of stacks, advances in implementing decentralization, Bitcoin and blockchain technology. The Internet has decentralized communications between people, BitTorrent has shown us the power of peer-to-peer file sharing, and Bitcoin has decentralized money, but online commerce is still largely centralized. To date, there is no standard protocol for trading goods and services online, nor is there an open, global network to share information about those goods and services. Enters OpenBazaar who finally creates a protocol and network that is free and open for all. In life, we take some of the existing protocols for granted, but some magical things happen when they are being followed. For example, traffic lights are the protocol for orderly movement of vehicles on the road, restaurant reservations are the protocol for getting seated at a table when you arrive, a grocery store’s queue is the protocol for a successful checkout, and airport security checks are the protocol for disallowing dangerous goods or people from boarding planes. We see protocols everywhere. The field of computer engineering is full of technical protocols that are essential. One way to look at the OpenBazaar protocol is that it bridges technical capabilities with business necessity. It sits nicely between the Internet and Bitcoin on one side, and user, business and societal needs on the other side. OpenBazaar removes the intermediaries and allows people to trade directly with each other. The OpenBazaar network is decentralized, and free to use. Because the network has no central point of control, there are no intermediaries to collect fees, monitor data, or restrict trade. The code is open source, allowing for permission-less innovation. 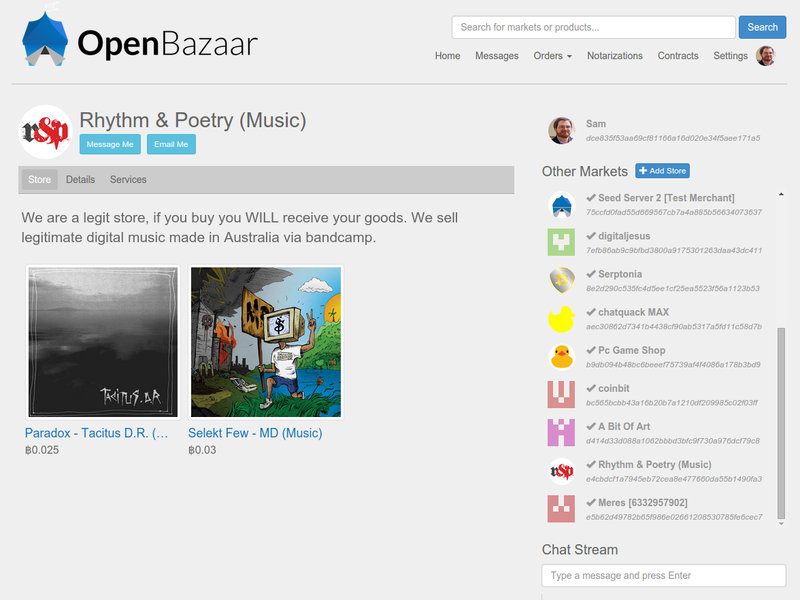 OpenBazaar is available to anyone in the world; there are no geographical restrictions and it uses the global digital currency, Bitcoin. A buyer can search the network, find what sellers are offering, and decide on buying. The buyer digitally signs the seller’s contract and sends it back to the seller. The seller agrees to the transaction by digitally signing the buyer’s version of the contract. A third party, called a notary, verifies both parties have signed and create a 2 of 3 multisignature Bitcoin account with the buyer, seller, and themselves as the third key holder. The buyer then funds the multisig, the seller ships the good and signs 1 of 3, the buyer receives the good and signs 2 of 3, and the funds are released. No fees or middlemen. At the heart of the OpenBazaar platform lies their implementation of “Ricardian contracts”. Ricardian contracts are digital documents that record an agreement between multiple parties, are signed and cryptographically verified, and formatted to be human and machine-readable. Ricardian contracts cannot be forged after the contract has been signed. If we fast forward into the future, I believe that the OpenBazaar promise has the potential to change how we conduct global commerce in the future. Once the network and contractual infrastructure is in place, and via the strength of their community’s ecosystem, the possibilities are there. From the get go, OpenBazaar has an unfair advantage. It will be the first large scale eCommerce network that is solely based on a single universal currency: Bitcoin. With that long introduction in mind, I am excited to be participating in their inaugural round of financing alongside Union Square Ventures and Andreessen Horowitz, and humbled by the privilege of a first row seat into their amazing laboratory of innovation. Given my previous history in eCommerce (I wrote the book Opening Digital Markets in 1997), running PeerIntelligence in 2001, and more recently via my Bitcoin and blockchain work, the OpenBazaar represents the ideal intersection of my three interests: ecommerce, peer-to-peer, and Bitcoin. For background, the origins of the OpenBazaar project was DarkMarket, a winning entry in a Toronto hackathon in April 2014. Incidentally, I was in that room when they presented, as part of my involvement with the Bitcoin Expo. Following the release of the source code on Github, the developers of DarkMarket decided to discontinue the project. A few days later, Brian Hoffman forked the project to continue development. Brian renamed the project to OpenBazaar, which reflected a shift in vision to create a free and open marketplace for all goods and services. Since April 2014, we’ve seen OpenBazaar change substantially from the original DarkMarket project. Only a small amount of the original code remains, and the majority of the features have been built by the OpenBazaar community, and is rather focused on fostering legitimate trade. 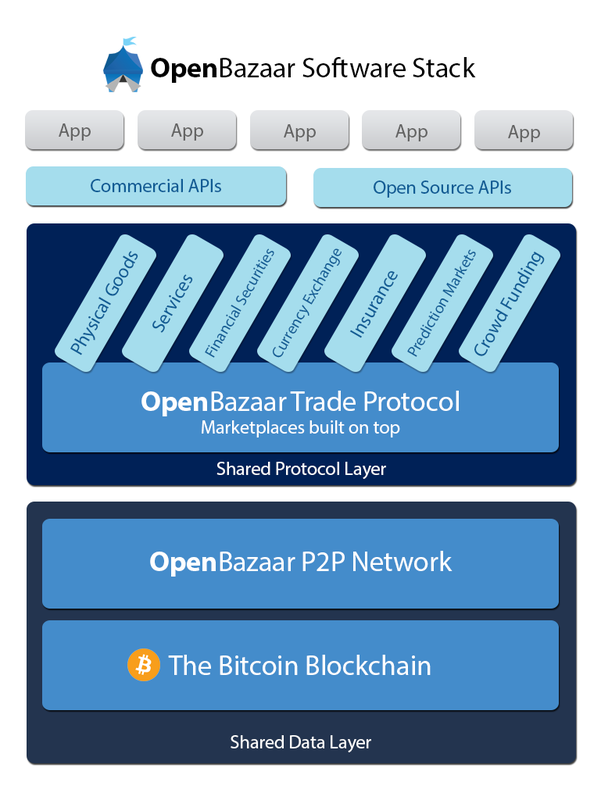 It is interesting to note that the founding team members of OpenBazaar had been thinking independently about the same problem, and their coming together brings a lot of intellectual and technical power to the project. Open, peer to peer commerce is as much about an ideology, as it is about a creative implementation of the Bitcoin blockchain technology. The OpenBazaar vision is real, because it is already being followed by a growing network of 1,400 developers worldwide, and it is generating innovation via a number of ecosystem partners and services that will be unravelled in the weeks and months ahead. Their ecosystem is advancing in lockstep with their core development and that’s a good thing. Please join me in wishing OpenBazaar and their community good luck as they take a leap ahead. Their ambitions are big, but so are the opportunities ahead for them, and for the future of global commerce. You can read about the funding announcement on their blog, OpenBazaar is Entering a New Phase with Funding. You can follow OpenBazaar on Twitter, Reddit, GitHub, and on their Blog. Most importantly, if you are a developer or an entrepreneur with ideas, you can get involved by contacting them directly at project@openbazaar.org.